This review was written for In This Moment #2. My wife loves the writings of Karen Kingsbury! This is one of her best series! Loved this book,as I do with all the Kingsbury series.So true to high light the present day fight for the religous freedoms we are slowly losing.A must read. Karen Kingsbury has done it again! What an amazing story. In This Moment deals with religious freedom issues - so relevant for today. Another well written book in the Baxter series! I cant wait for her next book! This review was written for In This Moment: A Novel - eBook. 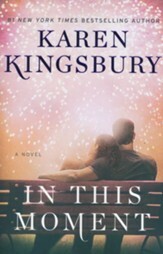 In This Moment by Karen Kingsbury is part of The Baxter Family series. Wendell Quinn is the principal of Hamilton High School and he is tired of what is happening in his school (drugs, violence, high teen pregnancy). Wendell is going to start a controversial after school program that could cost him his job. Wendell is a Christian and has decided to start a voluntary after-school Bible study and prayer group. After one year, Wendell has seen many changes to his school. Test scores are up, teen pregnancies and violence are down along with violence and drug use. The biggest change is in Cami Nelson. She is no longer angry, she believes in God and has discovered a love of writing. Wendell tells the parents about the program and Andy Nelson, Camis father, is not pleased. He contacts the local newspaper and files a lawsuit against Wendell. Wendell needs to make a choice. Stand up for what he believes in (what is best for his students) and fight the lawsuit or cave into pressure and disband the group. Wendell decides to fight and hires Luke Baxter to defend him. Can Wendell win the lawsuit, or will he lose everything? In This Moment has some nice writing and a decent pace. I did not realize In This Moment was part of such a large series until I opened the book. I had trouble reading the sections about Luke Baxter and his extended family. There are numerous family members and I was not aware of their various relationships and backstories (it was confusing). The Baxter family is not heavily featured in this book (fair warning to fans of the series). I found Wendell Quinn courageous for standing up for what he believes in and trying to improve the lives of others. Wendell trusts that God will get him through any situation (which He can) and his vocal about his beliefs. The story, though, is expected. It follows a predictable path with an unoriginal ending. The religious aspect is dominant and comes across as preachy. You can tell where the author stands on the issues presented in the book. I hope that there are people like Wendell Quinn out in the world, but I have never meet a person like him (or any of the people in the book). The characters felt forced (contrived, fake) and many situations seemed unrealistic. I am giving In This Moment 3 out of 5 stars. I'm in the process of reading "In This Moment" and so far it has been good and I've enjoyed all of Karen's books, they hold my attention and hard to put down. I pass them on once I've read em' either to a friend or to our church library.